As the federal government retracts from climate goals, a small tribal microgrid in Northern California is showing how to reduce greenhouse gases affordably one community at a time. 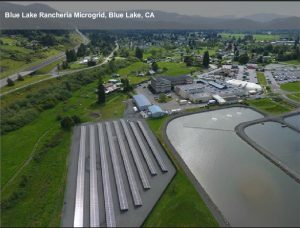 The Blue Lake Rancheria microgrid is now live and collecting data to share with others, according to project partners who spoke on a press call Thursday. Located in Humboldt County, the project demonstrates not only how to cut carbon dioxide emissions but also save money and provide reliable power in a crisis. “Through the course of this project it has become abundantly clear to me that microgrids are one way that smaller communities, smaller governments, like tribes, states, cities, counties, can leverage their own investment and move the needle to a lower carbon energy sector as fast as possible,” said Jana Ganion, the tribe’s sustainability director. 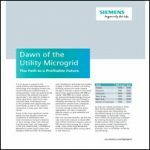 While small – it includes 500-KV and 950 kWh of battery storage – the microgrid’s advanced controller brings sophisticated brain power to its energy use and production and its relationship to the grid. As a result, the tribe can back off use of diesel and grid power and employ renewables. The microgrid is expected to reduce carbon dioxide emissions by 150 tons annually and save the tribe about $200,000 per year on energy. The project has convinced Ganion that the economic outlook for microgrids is “very solid,” especially for communities with “millions of dollars” invested in diesel generators, she said. The low-carbon microgrid helps the tribe with its long-term goal of “de-prioritizing” its diesel generators to “way in the back of the room,” she said. It does so via the microgrid controller, which manages resources so that the community gradually decommissions the diesel generators and switches instead to renewables and batteries. “That’s where I see real progress being made both economically and in terms of the climate action that we have to take,” she said. Clark Wiedetz, microgrid director for Siemens Energy Management, pointed out that use of solar and storage also allows the tribal microgrid to move away from buying grid power. When electricity prices are high, the microgrid will instead power the community via its on-site generation. The project also saves money through load-shedding, energy efficiency measures and by moving the community from being connected to the grid as a secondary to a primary user and taking control at the 12-kV level. A demonstration project, the tribal microgrid was funded through a $5 million grant from the California Energy Commission’s Electric Program Investment Charge (EPIC) program. The tribe and the project’s partners also contributed. For advanced control, the project uses Siemens Spectrum Power Microgrid Management System (MGMS) software. REC Solar installed the solar and Tesla provided the battery system. The tribal microgrid will serve government offices, commercial buildings (including a casino) and Red Cross safety shelter-in-place facilities, all situated across 100 acres. Blue Lake Rancheria tribal microgrid was designed to be replicated by other communities, and it is already getting calls from other tribes seeking information. Project collaborators include Humboldt State University’s Schatz Energy Research Center, Siemens and Idaho National Laboratory. Blue Rancheria also worked closely with local utility Pacific Gas & Electric (PG&E) while installing the microgrid. 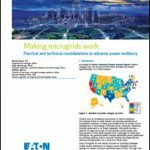 Track news about community and tribal microgrids by subscribing to the free Microgrid Knowledge newsletter.